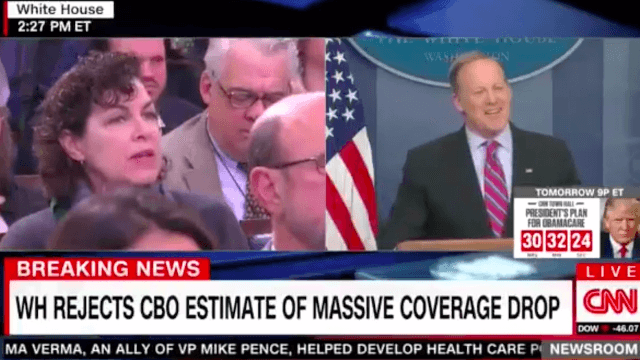 This reporter falling asleep during Sean Spicer's press briefing is all of us. Reporters are working really hard these days, much to Trump's chagrin. Because democracy dies in darkness, journalists are working overtime trying to make sense of WTF is happening in the Trump White House, as the 24 hours cycle keeps cycling at all times. Newsmax's John Gizzi caught some much-needed shut-eye when he could get it, which happens to have Tuesday's White House press briefing with Press Secretary/Easter Bunny Sean Spicer. Keeping up with Sean Spicer's lies is exhausting. John Gizzi's big nap came a day after the Twittersphere became obsessed with him as he became a real-life "Deal with it" meme. The eminently memeable Gizzi denies that he fell asleep on Tuesday, but Twitter isn't buying it. Did it ever occur to you that reporters look down to consult their notes before pising questions? come on bro! You crashed! It's all good! I would have too! no one is knocking you for dozing off, we have all done it! Sweet dreams, Mr. Gizzi. It happens to everyone.